Luxury corporative presents and gourmet gifts with Jamonify. What to choose a corporative gift or a gourmet gift? Giving is an art and as an art you should consider who is receiving the present and think about the gift itself. If we look at companies we will find the same problem just bigger, how to give a corporative present being personal and unique for anyone who will receive. Corporate gifts are normally a gift basket or they can adopt some new forms like tin boxes depending on who defines what goes within the corporate gift. If you do not know how or you are in a hurry some online companies are specialists in corporative gifts and baskets but this do not make them versed on gourmet gifts. Please note that it is the content within the basket which turns a corporative gift into a gourmet gift. -Artisan cheese (you should select some of them according to your personal taste like Cabrales cheese, Manchego cheese, Roncal or the famous tortas del Casar. -Extra virgin olive oil. Important! Only virgin oil! On its own or combined with truffle, garlic, chili or rosemary. Extra virgin oils specially packaged for corporate gifts are available in Spain from many oil producing regions not only Andalucía. -Foie gras or pâté. One of the best gourmet foods and perfect for a gourmet corporative gift is goose foie gras. -Canned seafood. The cockles from Rías Bajas, Santoña anchovies, clams, scallops and some many others. But please note you have to be very selective in order to create a gourmet selection of foods for good and special corporative gift. -Canned vegetables. Piquillo peppers, Navarra asparagus, dried tomatoes in olive oil, pâté made of vegetables (like olives, tomato or mushrooms). -Artisan cold meats. Ham, chorizo, sausage, Ibérico pork loin. White and rosé wines that should be chosen, albariño, verdejo, Rueda and some from Andalucía and La Mancha. In Spain the wide range of available makes the selection task harder so the buyer should investigate which wines are better and pair perfectly good with the selected gourmet foods. In our humble opinion as devotional acorn Ibérico ham lovers; only corporative gifts which include acorn Ibérico ham deserve to be called truly gourmet corporative gifts. Some online companies –JAMONIFY, the leader among them as we have witnessed, offer pure acorn Ibérico ham hand cut and vacuum packaged, so all its properties and taste are kept intact. An impressive and exclusive packaging that preserves the unique umami flavour of the pure acorn Ibérico ham. 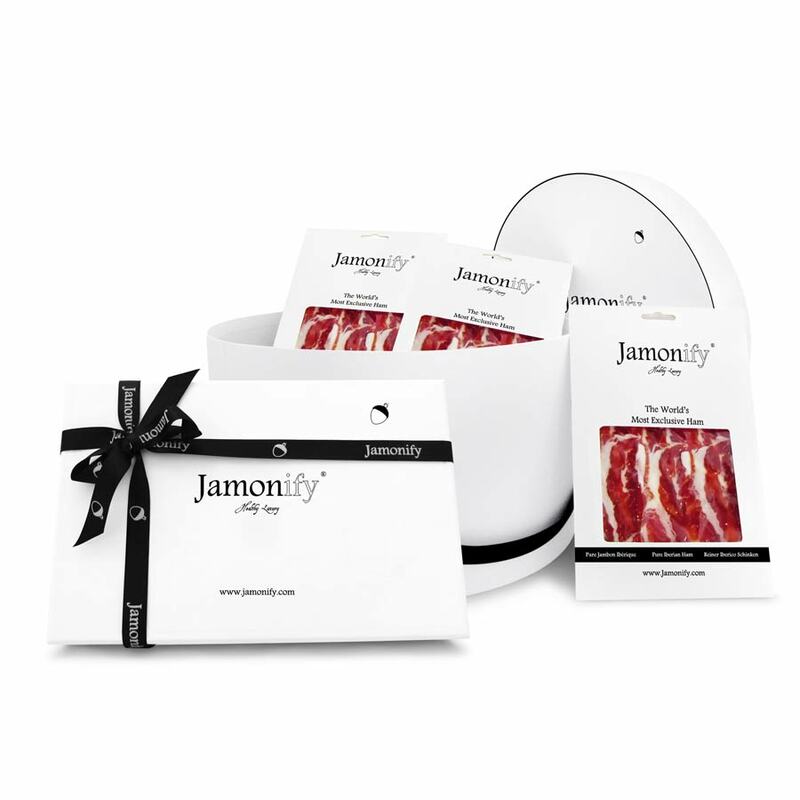 Gourmet corporative gifts made with Jamonify (pure acorn Ibérico ham) will become exclusive gourmet corporative gifts and whoever receives this kind of present will be flattered and felt pampered. Companies who turn their corporative gifts into gourmet corporative gifts they also transform its corporative image into a more distinguished and exclusive one. Just to conclude, our product range is wide, delicious and exclusive but there are even more gourmet products for a gourmet corporative gift that selection is the key to make an exclusive present which will enhance our image as company and will bring joy to our customers and friends.